A vintage Corvette is truly a collector's item, albeit a very expensive collector's item, and one that would never quite work out as a dorm supply, since it wouldn't fit in your dorm room, even if you don't have a lot of dorm stuff. 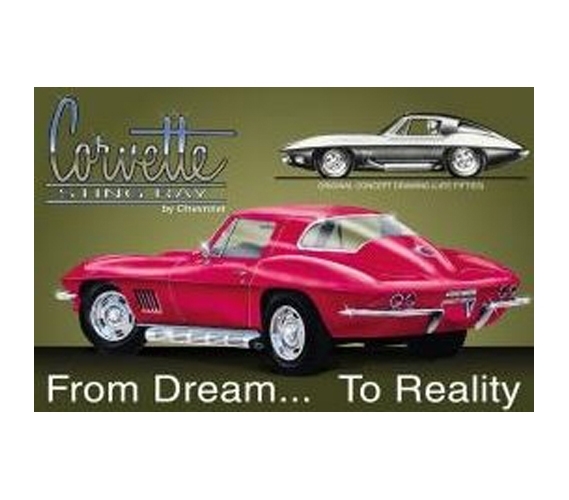 Instead, include this Dream Corvette Tin Sign as part of your must-have dorm room supplies. It's a cool wall decoration for college that makes for a distinct look for your college decorations. Fun, must-have dorm supplies are cool items for college that will help your dorm decor look the best it can. If you're a fan of classic cars, tin signs for college and wall decor items are really the only college supplies that can convey your interest, as other dorm essentials like comforters for college and trunks for dorms don't often have Corvette design themes. So let your dorm wall decor items shine!